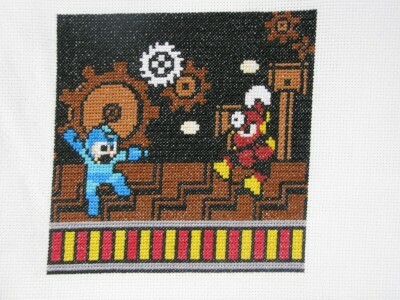 Part 2 of my multi-part MegaMan stitching series is complete! (here’s the first part). I think I’m going to tackle the logo next and that’ll fill up my canvas. 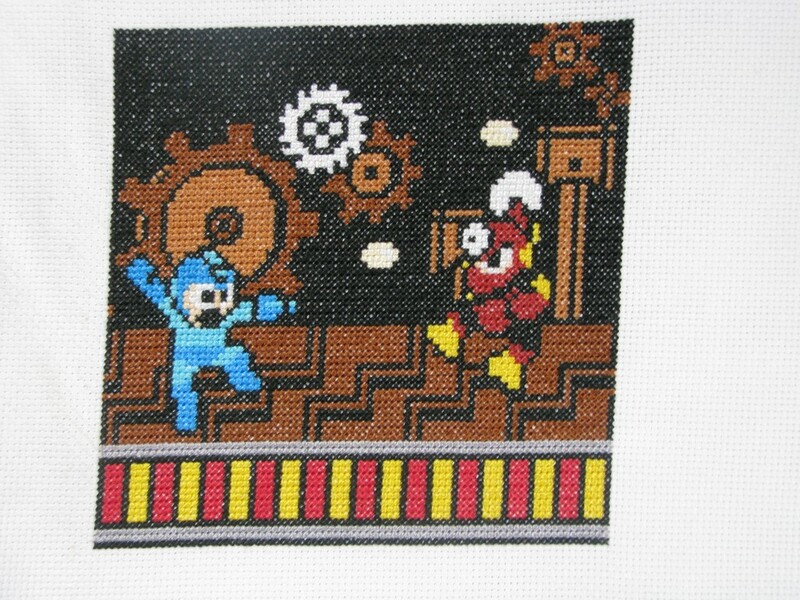 With my spare time in the last month, I’ve been crafting up a MegaMan 2 cross stitch scene from the final battle with Metal Man; that’s why my posting’s have been sparse. The total scene is 81 X 81 squares (6561 stitches) and it took me about 50 to 60 hours and I got through a lot of hockey as well as the Caprica, Spartacus and the Terminator series’. 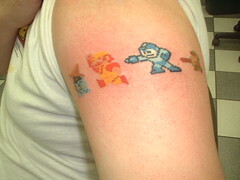 If all goes according to plan, I have 7 or more to do – I’m on to Flash Man next. 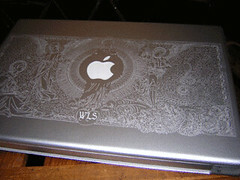 I got the graphic from RedHerring1Up who did the project with beads – see all the levels here if you want to preview what I’m going to be doing for a few years. See my previous crafty MegaMan post and play the game here. 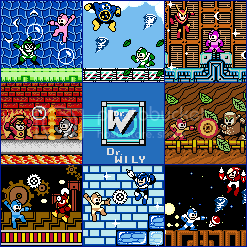 Lately, I’ve been finding all these old Megaman crafts and games very interesting. 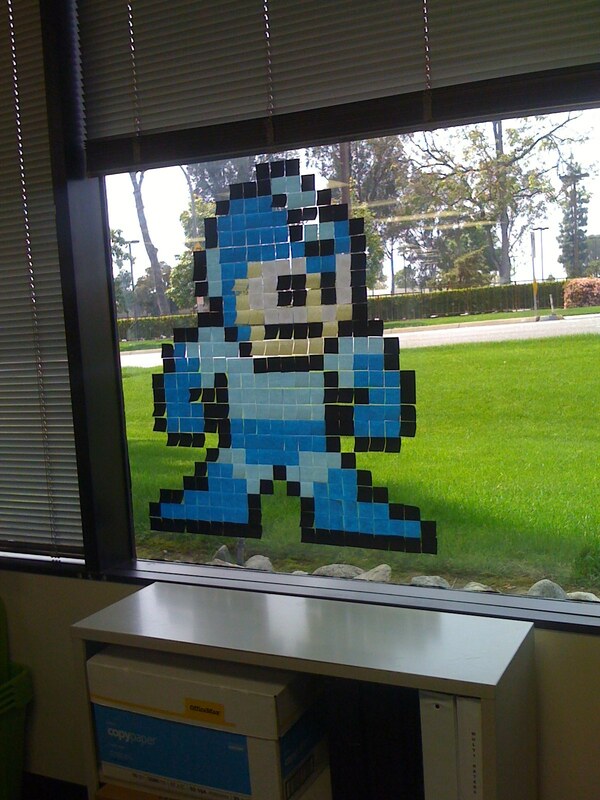 I’ve found the post it note window picture like the one above, the cross stitch megaman from a few posts ago, a new favicon.ico, a boss beating shirt, a golden book, chain mail, a lot of quilts, an afghan, a card holder, a mosaic, a tattoo, stained glass, sprite charts, guitar versions of the music, the game itself online, or megaman playing super mario brothers. Phew – lastly, for those that like other games too, there’s sheet music for Super Mario Brothers. 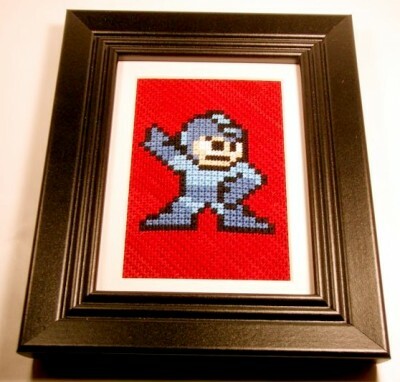 I’ve been thinking of ways to merge my geeky side and slightly effeminate crafty side into a cool project and this cross stitch project is starting to look like the perfect fit. 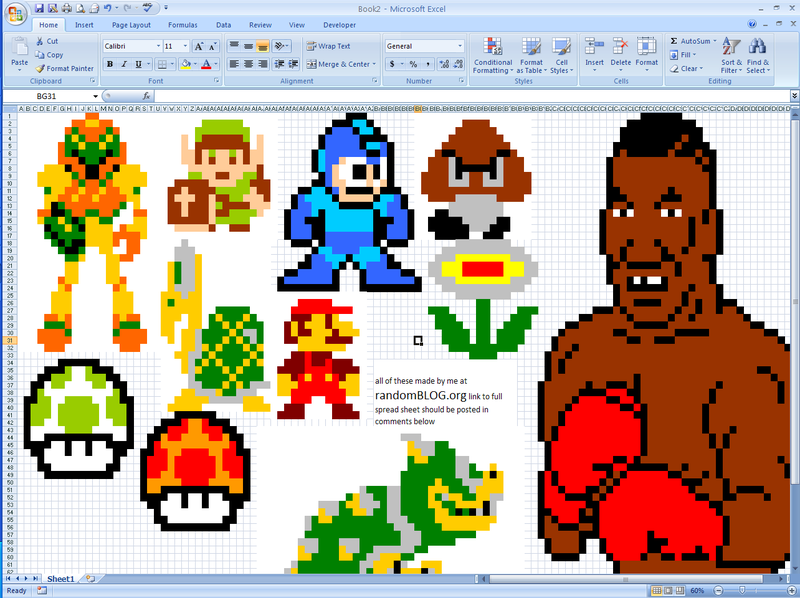 As you may remember, I did all my Excel preparation beforehand. 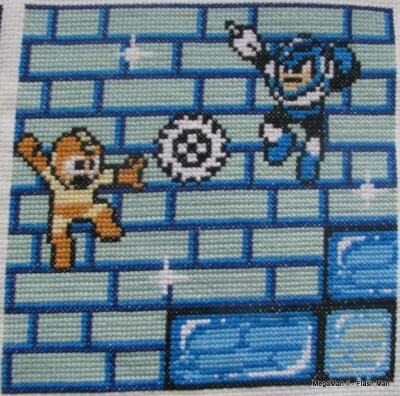 The person who did these MegaMan cross stitched beauties even gives a tutorial outlining the colors that you’ll need to get (black (310), white (5200), a fleshy color (945 or 744), light blue (3846) and dark blue (3843)) as well as the software to make new patterns and get the color recommends (PCStitch). 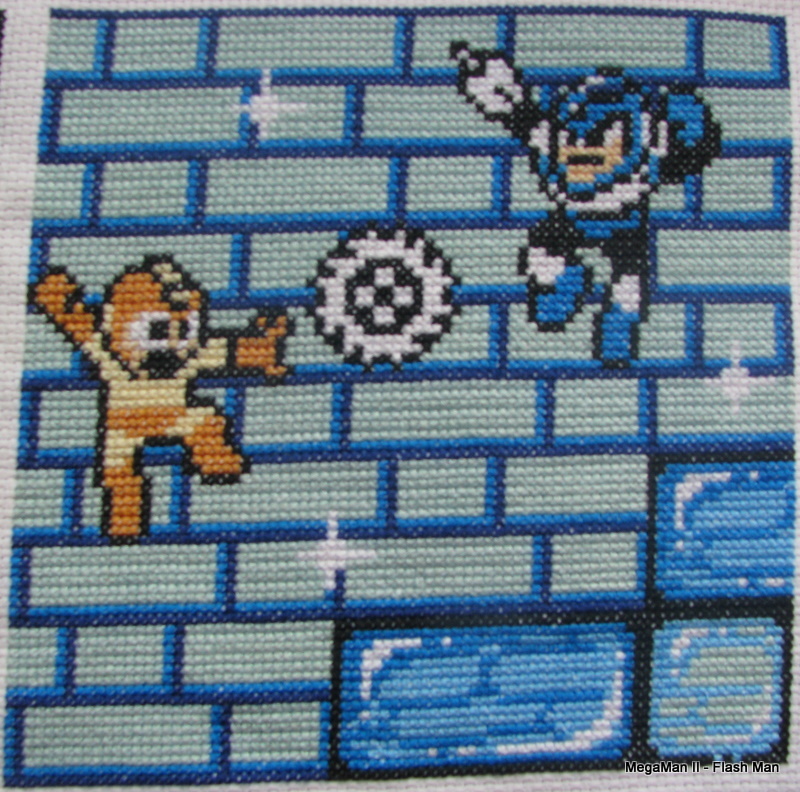 This should be a more adequately sized project as opposed to my slightly impossible goal of making a crocheted MegaMan blanket. 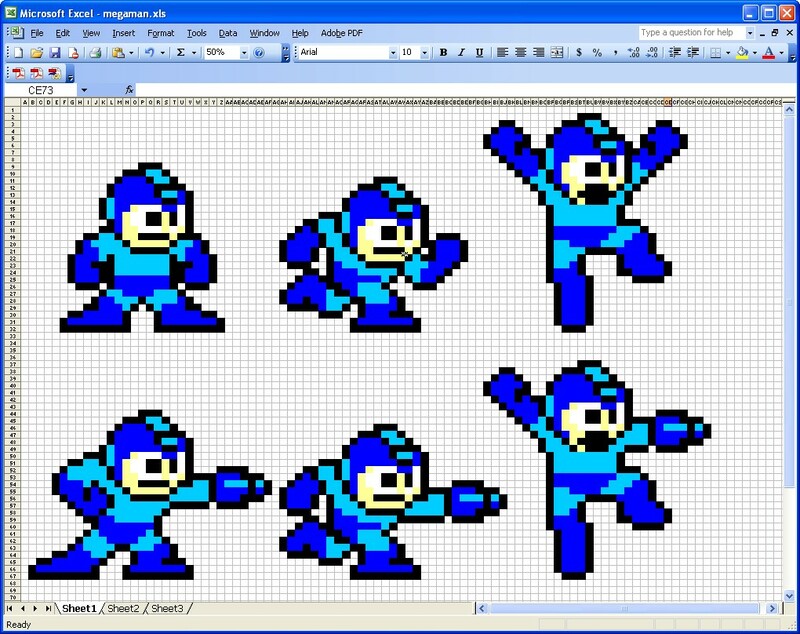 I drew some inspiration from this guy via reddit in conjunction with this classic Megaman sprite sheet to make my own Excel art. 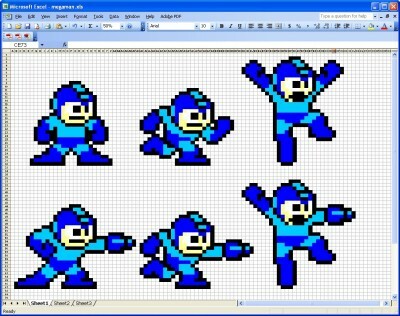 It was great fun to come up with a bunch of cool Megaman characters really easily in Excel. Now, what sort of interesting things could I do with this next?